This unique book was first published in 1974. 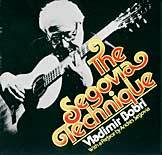 The author was a friend of Segovia and a founding member of the New York Society of the Classical Guitar. Actual photos of the Maestro’s hands in action, plus many illustrations, constitute a veritable master class in the Segovia Technique.